The First Nations Leadership Council is greatly troubled by recent comments by Prime Minister Stephen Harper and Minister of Natural Resources Joe Oliver advocating for the proposed Enbridge Gateway pipeline to proceed even before the Joint Review Panel’s environmental review has begun. Grand Chief Edward John states, “Federal politicians advocating for and promoting the proposed Enbridge project before the environmental review commences puts the entire review process in jeopardy. We question how the three National Energy Board panellists, who were appointed by the federal government, can fairly review this proposal when the Prime Minister and Minister of Environment openly promote what they perceive as the necessary outcome? In the end, it will be the federal government which decides on the panel’s report, a decision that has apparently already been made”. “The federal government has a clear legal responsibility to consult with First Nations. Given the long list of Supreme Court decisions on the range of consultation options and given the magnitude of the potential impacts of Enbridge’s proposal, the necessary consultation standard must be to seek the informed consent of First Nations’ whose Aboriginal title and rights will be impacted by this proposed project”, added Chief John. 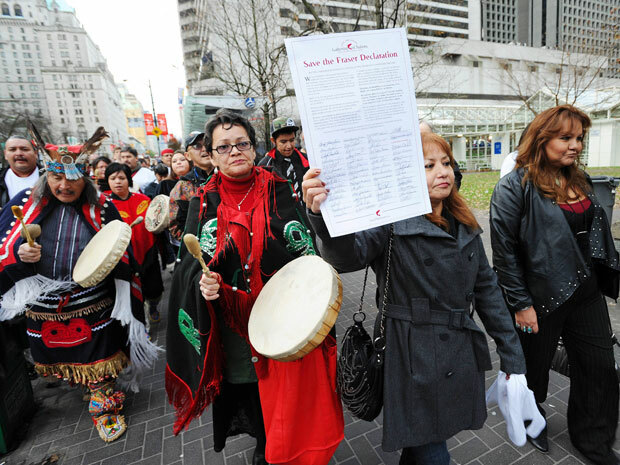 The First Nations in British Columbia are reminding governments that substantive changes to the environmental review process without engaging First Nations governments contradicts the doctrines set out by the Supreme Court of Canada in Haida Nation v. British Columbia and to the principles set out in the United Nations Declaration on the Rights of Indigenous Peoples. Any changes must be made on a tripartite basis with First Nations being fully engaged in meaningful consultation. It is the intention of the BC First Nations’ leadership to raise the environmental assessment processes in the upcoming meeting with the Prime Minister and Cabinet at the Crown-First Nation Gathering on January 24, 2012 in Ottawa.